This was formerly a consignment furniture store. What you’re about to see is what the ladies from Circe did with this space, around the corner from their original store in Chenoweth Plaza. Circe is now Circe/SWAG, a blended store with the same Circe, the same Beauty Bar, but with the addition of SWAG, a more casual, preppy men’s and women’s clothes shop that also offers gifts. There’s a lot to buy under this roof. In fact, you would be hard-pressed to go in here and not buy anything. Where to start with a project as big as this? Take down all the walls and reconfigure the space within the area you are given. They knew there were going to be two separate areas, one for Circe, one for SWAG. They started from scratch and accomplished all of this in a matter of months. Might I say, well done! I came to see the building as it was being gutted on September 23. It is hard to believe how quickly they got the space renovated and all moved in. Walls gutted. This picture was taken on September 23. Different view, but same space on September 23. Panoramic view taken September 30, one week later. Inventory aside, this store is quite gorgeous. Jennifer Smith from Circe did the design herself. I asked her quite frankly why she was working in retail, when she has such a talent for design. Every inch of this store is perfectly designed. These signs were handmade here in Kentucky by artist Kirby Stafford. The Circe sign is brass and the SWAG sign is in stainless steel. Both are hollowed out in the letters to reveal this raised mosaic tile that covers the check-out desk and back wall. 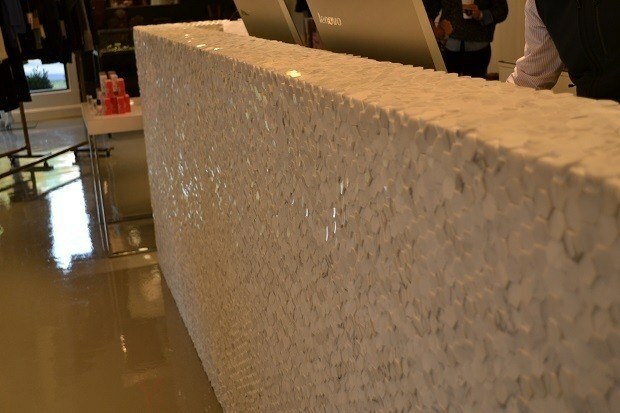 Raised mosaic tile makes up the check-out desk and back wall. Handmade brass clothes racks are all over the store. They are like works of art unto themselves. Even the hold racks near check out are handmade brass. The furniture is covetable, as well. Outside the dressing room on the Circe side, guests may never want to leave these chairs. Guests on the SWAG side can sit here while watching television. 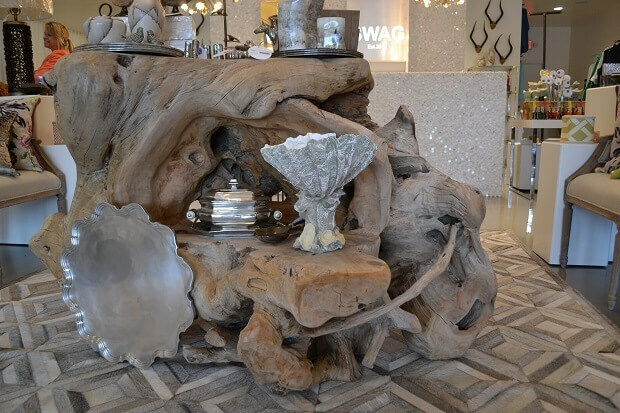 This is in the center of the space, a beautiful driftwood table with silver and gifts displayed on it. Sloan’s Beauty Bar is top notch, with great natural light and three custom made stools. A tasting of the brands that SWAG is carrying. Vineyard Vines hats in all neon colors. Sperrys for both men and women. SWAG is more than clothes, it also includes gifts of all kinds. Gifts for men, women, and your home are all included here. Eventually they will be adding a bridal registry option here. Jennifer and Laura Lee said it was years of feedback that led them into the gift market. People wanted a one-stop shop, where they could buy clothes and things for their home. A buffet of men’s gifts here. 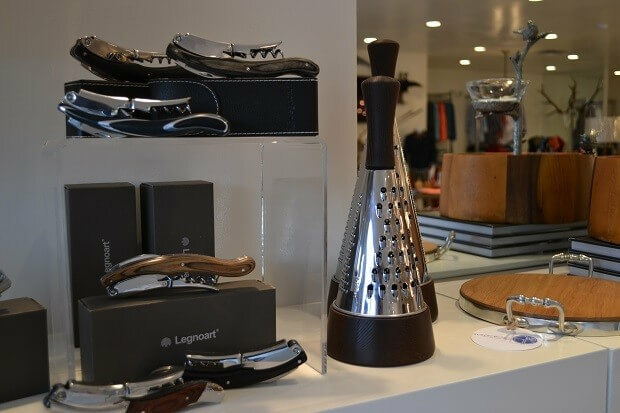 Everything from a cheese grater, to a wine opener, to glasses to a tissue holder for sale here. Circe/SWAG is still located in Chenoweth Plaza but on the corner lot, closer to Brownsboro Road. Like them on Facebook here: www.facebook.com/circelouisville and www.facebook.com/swaglouisville.